It never used to be that way. From the first plantings in Jamestown, when it was illegal not to grow hemp, to our Founding Fathers’ hemp plantations, to the hemp sails and rigging of the clipper ships that sailed the 19th century seas, to the hemp canvas-covered wagons of the pioneers headed west, to the sturdy hemp Levi’s pants of the original 49ers seeking their fortunes in the California hills, to the massive “Hemp for Victory” government program of WWII, hemp has developed a long and illustrious history in America. 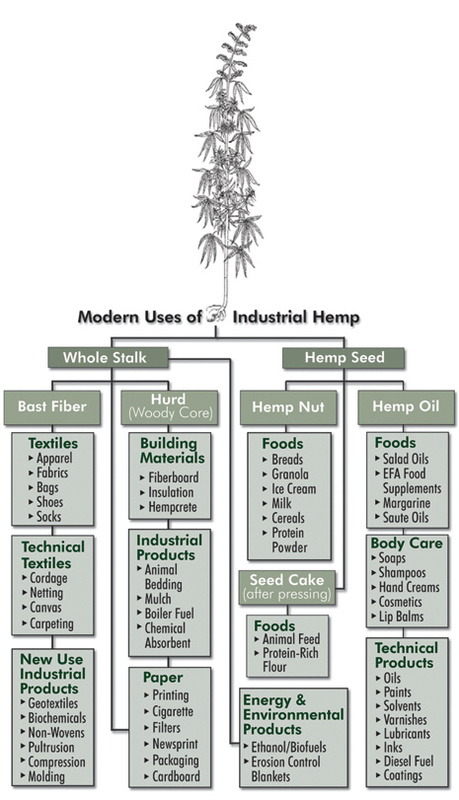 In fact, hemp has been used extensively for millennia in cultures around the world and belongs to humanity’s common agricultural and commercial heritage. The seed was known for its healthy protein and rich oil. The outer bast fiber from the stalk was used for clothing, canvas and rope. The useful inner core fiber (or hurds) was used for construction and paper production. In fact, the Declaration of Independence was drafted on hemp paper, and the finest Bible paper remains hemp-based even today. In the early 20th century, some researchers were beginning to look at using the cellulose from hemp as an affordable and renewable raw material for plastics. Henry Ford actually built a prototype car made out of agricultural fiber biocomposites, including hemp. 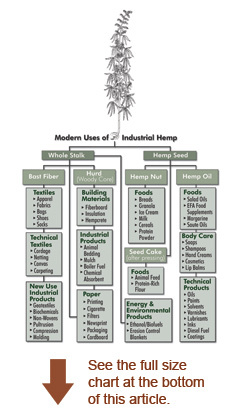 Industrial hemp varieties of the Cannabis plant, also referred to as “fiber” or “low-tetrahydrocannabinol (THC)” hemp, should not be confused with psychoactive “marijuana” varieties of the plant. In fact, they are quite distinct varieties or breeds of the same plant species, much like a St. Bernard and a Chihuahua are very different varieties of the same canine species. It is not possible to get “high” from hemp. Hemp has a well-established meaning in the international community, referring to non-psychoactive Cannabis varieties. Regulations in the European Union and Canada conservatively mandate less than 0.2% and 0.3% THC in the flowers, respectively. In contrast, marijuana varieties generally contain between 3% and 15% THC in their flowers. Because of their minimal THC content, flowers and leaves from hemp have absolutely no value as a psychoactive recreational drug. In spite of this, the DEA continues to intentionally confound non-psychoactive hemp varieties of Cannabis with psychoactive marijuana varieties. The U.S. is the only major industrialized nation in the world to prohibit the growing and processing of hemp. However, non-viable hemp seed, oil and fiber are all currently legal for import and trade in the U.S., and domestic industry has continued to import them for diverse uses every year since the Marihuana Tax Act, effectively making marijuana illegal, was passed by Congress in 1937. Industry estimates put the total North American retail market for hemp products at approximately $450 million in 2012. Despite large renewed domestic production during WWII, hemp’s cultivation and use in the U.S. was essentially discontinued in the mid-20th century. This was largely due to misinformed and misguided fears that industrial hemp is marijuana, and hemp became demonized during the “reefer madness” craze that swept the country over much of the last century. Despite easily discernible and widely accepted differences between the two distinct plant varieties, serious misconceptions continue to persist to this day. This is not the case for our “neighbors to the north,” however. For the past fifteen years, Canadians have shown that they can distinguish the difference between hemp and marijuana in their farming communities. Farmers: hemp can help farmers looking to diversify their farm operations. Hemp fits well into increasingly popular organic, low-input and sustainable methods of agriculture. Reform-Minded Businesses: hemp’s valuable fiber and significant biomass productivity can help companies “go green” by creating a wide variety of opportunities and supplementing or replacing more commonly used, problematic and stressed-out raw material sources. Nutritionists and Health Food Advocates: hemp’s oil-rich seed has an exceptionally high content of vital essential fatty acids (or EFAs, Omega-3 and Omega-6) that nutritionists have found to be commonly deficient in our diet. A diet rich in EFAs can help alleviate and prevent many common ailments. For similar reasons, hemp oil is increasingly employed in the natural body care industry as well. Hemp, of course, is not in itself a total panacea for the social, economic and environmental woes that plague our planet today. Indeed, no single crop can be. But, with focused and sustained research and development in both the public and private sectors, hemp and other qualified annual crops are poised to spur dramatic — and certainly vital — change. These renewable resources will transition our major industries from depending on non-renewable, fast-disappearing resource bases to being driven and supported on a sustainable economic basis by the annual agri-industrial produce of the Earth’s fertile fields. With thirty-one other nations growing industrial hemp and the U.S. representing the largest consumer and industrial market for their hemp products, we are poised to take advantage of an unprecedented opportunity. Americans are becoming more aware each day of the significant possibilities and benefits that hemp presents. We are in the midst of a sea change on Cannabis policy in America, with both Washington and Colorado recently voting to dismantle Cannabis prohibition generally and directing their state legislatures to enact industrial hemp farming programs in particular. They join other states such as North Dakota that are ready and willing to cultivate industrial hemp as soon as the federal government gets out of the way. Fortunately, Sen. Rand Paul (R-KY) and Sen. Ron Wyden (D-OR) are currently spearheading efforts in the Senate to do just that: direct the Department of Justice to allow states the choice to regulate industrial hemp without federal interference. Moreover, due to the strong ethical consumer base that drives the U.S. hemp market, the development of that market is poised to spur pioneering domestic fair trade certification in the U.S., just as it has been doing in Canada via the leadership of the Farmer Direct Co-operative (which supplies Dr. Bronner’s Magic Soaps with hemp seed oil for various products).